Rochester's R&E riders of 1930 learned only a few days in advance that R&E service would cease forever with the runs of July 31. As that date approached, final preparations for the discontinuance were made. Nine R&E cars were run off the line and out to East Main Station in Rochester, leaving in readiness only the five cars needed for last-day operations. Wallace Bradley, a Rochester newspaperman and a fan of Rochester's electric railway network, was visiting his sister at her place of employment, the Graflex plant near the intersection of Main Street West and Broad Street, on Wednesday, July 30, 1930. From a window several floors above street level, Bradley saw one-of-a-kind R&E car 157 coming up the ramp on Broad Street from the Subway. Knowing the end of the R&E was near and that this might be his last chance to photograph a car in action, he grabbed his loaded camera and raced out the door. Making a mad dash to catch 157, hoping his camera was ready to go, Bradley did manage to take one precious photograph of 157 before the car disappeared on its way to East Main Station. This was the car's very last run, and his hurried shot is the only known action view of NYMT's car 157. The exact location of this scene is a bit tough to really identify because of its fuzziness. Prior to 1923, a wye on Oak Street at Main Street West had been used for turning cars. Construction of the Rochester Subway included a ramp to the surface on Broad Street just west of Oak Street, and new track built in 1923 formed a loop on Oak and Broad Streets. Cars from Main Street West traveled west on Broad, then south on Oak to regain Main Street. Cars entering or leaving the Subway followed these same directions of travel. Thus, when 157 left the Subway ramp, it would have turned right onto Oak Street and continued south to reach Main Street West. The dark rear end of 157 tells us it is indeed traveling generally south; the long shadows on the west side of the car mean it is still a morning hour. 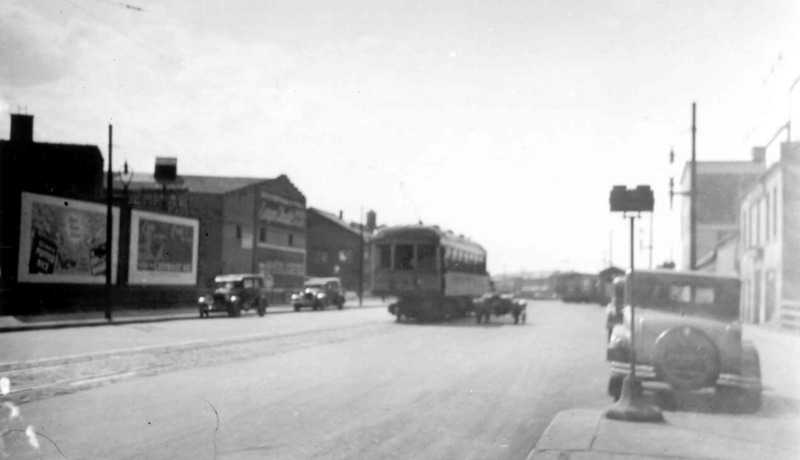 What had been Oak Street in 1930 is now the short section of Broad Street where it intersects Main Street from the north, a rearrangement of streets being made necessary in the early 1970s by the construction of I-490. Not only is Bradley's photograph historically important now as we pass the 75th anniversary of the cessation of R&E service, this image's negative has finally wound its way to NYMT. As related elsewhere in this issue of Headend, Tom Kirn has recently donated all of Wallace Bradley's priceless negatives to NYMT. Examination of the original negative, the very piece of film that was in Bradley's camera during his race with 157, shows us that he did indeed use his own camera. Each of Bradley's 116-size negatives (2½" by 41/4") has a distinctive four-notch marking on the edge of the frame and, sure enough, Bradley's negative of 157 has the tell-tale four notches. While we can lament the passing of the R&E, it is much more comforting to realize that not only does the interurban car in our present photo reside at NYMT, so too, now, does the negative of its only in-service action photo.